Since Spring Training, it has seemed like a foregone conclusion: the Yankees will make a deal for a starting pitcher. Now, with the announcement on Tuesday that left-hander Jordan Montgomery will require Tommy John Surgery to repair his throwing elbow, the need is more pressing than ever. Thanks to a lack of consistency from everyone in the Yankees rotation aside from ace Luis Severino, Brian Cashman will have to work his magic again to ensure that New York has a fighting chance against their American League foes if the Yankees make a playoff run. So, what moves can Cashman reasonably make that would bolster the Yankees rotation for October baseball? Well, we might as well start with the obvious. Even if you’re a casual follower of the game, there is little doubt you’ve heard the rumor of a future Hamels-Yankees relationship. With Texas in the basement of the American League West and with four tough teams in front of them, there is little doubt that the Rangers will be willing to move some of their more expensive pieces in exchange for Minor League talent. On the top of that list is veteran southpaw Cole Hamels. Though nearing the twilight of his career at 34-years old, Hamels has put up solid numbers for a struggling Texas team in 2018, currently posting a 3.86 ERA while allowing just 69 hits in 79.1 innings. While he did put up a less-than-spectacular 4.20 ERA in 2017, the veteran has only finished a season with a 3.99+ ERA three times in his career. Hamels is currently playing in his 13th Major League season. Consistency has never been Hamels’ problem. It seems like a match made in heaven, but the trade would inevitably come with some downside. For starters, Hamels has not carried his usual consistency into the postseason. While he does sport a solid 3.48 career-postseason ERA, he has had some playoff performances that were outright bad. In his most recent appearance, pitching for the Rangers in the 2016 postseason, Hamels gave up six earned runs in just 3.1 innings against a then-stacked Toronto lineup. Yankees fans may also remember facing Hamels in the 2009 World Series, when the lefty allowed five earned over 4.1 innings in his only appearance of the Series. Sure, those Blue Jays and Yankees lineups were forces to be reckoned with, but if the Yankees make it to the postseason Hamels can expect to see more of the same. Whether it’s Houston, Boston, Cleveland, or Los Angeles, the Yankees' pitching staff will be up against some of the best lineups in baseball on the road to the World Series. The other problem with a possible deal for Hamels (and possibly the most troubling) is the haul it will take to nab him from Texas. When the deadline approaches, Cashman’s biggest obstacle in the market will be the fact that there simply aren’t many name-brand starters for sale. Hamels may not be the ace he once was, but he will likely be the pitching-gem of the 2018 deadline, and anyone who took Econ 101 can tell you that demand dictates price. Fortunately for Cashman, Hamels is set to be a free agent after this season (barring a $6 million buyout), making him a rental in the truest sense. This undoubtedly lowers his price tag and saves the Yankees their top prospects (think Gleyber Torres, Clint Frazier, Justus Sheffield). Still, the Yankees will likely have to part with a top-10 prospect, or someone near it at the very least. A guy like Chance Adams could be a piece targeted by Texas, and despite a bloated 5.26 ERA with Scranton Wilkes-Barre this season, Adams is one of the Yankees' best pitching prospects and is probably close to Major League ready. There is a bit of risk involved with this Hamels hypothetical, but he is by no means the only option Brian Cashman will pursue in the coming weeks. There are a few low-risk options that could be anchor options for the rotation heading down the stretch; and, yes, there are a few pipedreams that the Yankees would have to sell the farm for…but we can dream. In his first full season back from shoulder surgery in 2016, Tyson Ross is having good year for the Padres, who are 4.5 games back of Arizona in a weak N.L. West division. Sporting a 3.31 ERA in 12 starts, Ross has shown the ability to put up numbers similar to those that earned him an All Star appearance in 2014. That season, Ross pitched to a 2.81 ERA in 31 starts for San Diego. Since becoming a full-time Major League starter in 2013, Ross has posted a 3.52 ERA in 641.2 IP. The biggest downside with Ross is command issues. He doesn’t give up a ton of hits, but his walk totals routinely place on the bad end of league rankings. In 2015, an otherwise good year for Ross, the righty led the Majors with 84 walks issued. Control problems can bite you when facing the kinds of offenses he might see in the postseason, but Ross could be a valuable back-end starter for the Yankees down the stretch. While he is a rental, San Diego isn’t totally out of it yet. Ross won’t cost a top prospect, and he may not draw near it, but the Yankees would have to anticipate losing some young prospects with high upside at the very least. Maybe Cashman will spend more if Yankees scouts feel that Ross has completely returned to his pre-injury form. While he is within the Yankees division, J.A. Happ of the Blue Jays could be a solid back-end pick-up for New York before the deadline. The 35-year old veteran placed sixth in Cy Young voting in 2016. This season he is striking out batters at an 11.08 K/9 clip and has already compiled seven wins despite a 4.08 ERA. Happ is in the final year of a three-year contract with Toronto, and given the Blue Jays' recent struggles, he might come as the cheapest option for the Yankees. Even if Happ is now past his prime, he could give the Yankees some quality starts and he adds another veteran presence in the clubhouse. Happ is also a lefty, one of the most valuable commodities in baseball. Notice that I said, “or.” There is no way the Yankees could grab both of these guys and anyone who says otherwise should be ignored; they only need one of them to slot in between Severino and Tanaka to create a formidable postseason rotation with the veteran Sabathia on the back-end. Still, this is pipedream territory. While the sputtering Metropolitans might be willing to deal one of their stars, the price tag will be astronomical. 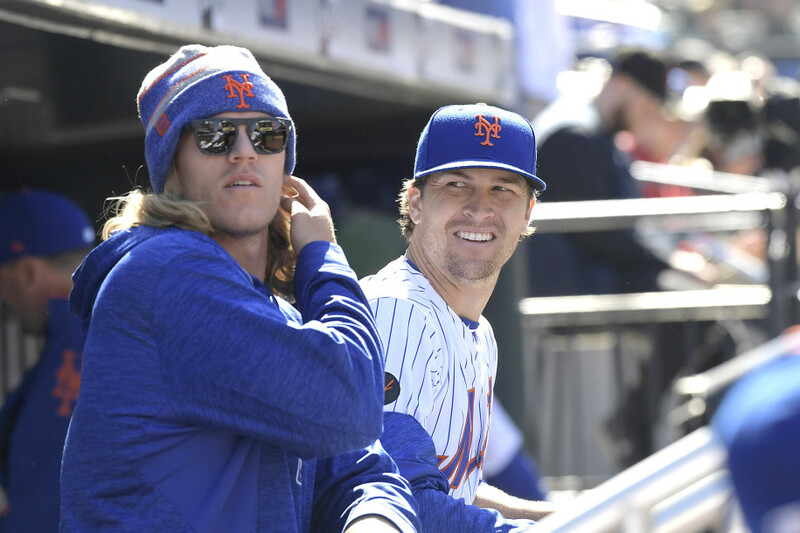 Both Syndergaard and DeGrom have proven themselves in the Majors and are widely considered among the top pitchers in the game today. Moreover, they are the two faces of the Mets franchise at this point. But let’s be honest, this is a Yankees-Mets trade we’re talking about here. A major trade has not been made between the two clubs since the Bombers traded away a haul of prospects for an aging Armando Benitez in 2003, who they quickly flipped for veteran Jeff Nelson. The Mets won’t be willing to part with either for any less than some combination of Gleyber Torres, Clint Frazier, Miguel Andujar, and Justus Sheffield. Just reading that might make a Yankees fans’ heart sink, but it’s the stone cold truth. We also have to wonder how serious the Mets are about trading any of their pitchers, and to what extent they might just be testing the waters. The Yankees might have to give up a chunk of their offensive core, but the thought of either of these guys in a postseason rotation should make the Bronx faithful salivate. The mother of all pipedreams! Arguably the greatest postseason pitcher of the last decade and he could be wearing Pinstripes in a few weeks. Never mind the fact that the Giants have a team-option for 2019, and the fact that San Francisco is right in the thick of the race for the N.L. West title. Never mind the fact that the Giants went out and made moves to acquire impact veterans like Andrew McCutchen and Evan Longoria to make a run at the division. None of that matters, he should be a Yankee! Sarcasm, of course. 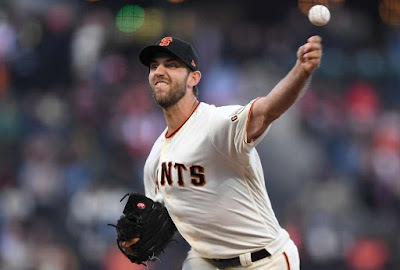 The haul it would take to land Bumgarner is in the same range as the imaginary DeGrom/Syndergaard package, if the Giants are ever serious about dealing him. The biggest issue, the same thing that could up the price on Tyson Ross, is that there isn’t a team in the N.L. West that has distinguished itself and taken control of the division. Realistically, San Francisco might miss the playoffs but stay in contention until September. If the Giants are within four or five games of the division lead at the deadline, they might not see any reason to part with their ace when they could still use his services next year. Gleyber Torres and Clint Frazier are appetizing, but Bumgarner is elite personified. It doesn’t matter. Forget all those other guys, Bumgarner will be a Yankee. Come October he’ll be in pinstripes and hurling four-seamers past the bats of the A.L.’s finest. We can dream, folks.